Climate change presents huge challenges for nature conservation. One important way to save species as climate change worsens is to maximize linkages or ‘connectivity’ between natural ecosystems. Initiatives such as Gondwana Link, the Great Eastern Ranges Initiative (or Alps to Atherton) and Yellowstone to Yukon aim to re-connect fragmented landscapes across enormous areas. The Victorian Government’s recent Land and Biodiversity White Paper promotes the creation of regional Biolinks to improve ‘the potential of plants and animals to disperse, recolonize, evolve and adapt naturally’. This a fantastic initiative, but it is a big ask. Tree planting is expensive, and planned linkages cross large areas of private land, including productive farmland. In some areas, large areas of cleared land are being revegetated. In fact, this is happening right now, for free. It’s just that we haven’t paid much attention to it. Across eastern Australia, populations and land uses are changing greatly as traditional agriculture is being replaced by newer land uses, especially by ‘rural amenity’ land use. The social researcher, Dr Neil Barr, has shown how this demographic change affects regional economies, land use and industries. It’s highly likely that it will also affect vegetation patterns, as native plants regenerate after agriculture declines. In a new paper, Luke Geddes, Lisa Smallbone, John Morgan and I documented how vegetation cover has changed over 60 years in a rural amenity area in central Victoria. The paper (Geddes et al. 2011) was published in the journal, Ecological Management and Restoration. We studied a 100,000 ha area near Heathcote, Nagambie and Murchison. In recent decades, many farms in the area have changed from grazing properties to a variety of amenity land uses, such as hobby farms, bush blocks and investment properties. We used old air photos, from the 1940s to 2000s, to map how native vegetation changed over time. The results were quite staggering. In the 1940s, most private land was cleared paddocks with scattered trees. Nowadays, many paddocks are covered with native trees and shrubs. This change is visually dramatic, as can be seen in the aerial photograph and Google map below. An aerial photograph of the Murchison area taken in 1945. The same area now. You can move around the Google map using your mouse. The patch of bush in the top left is uncleared box-ironbark forest. This patch is also in the top left of the 1945 air photo. 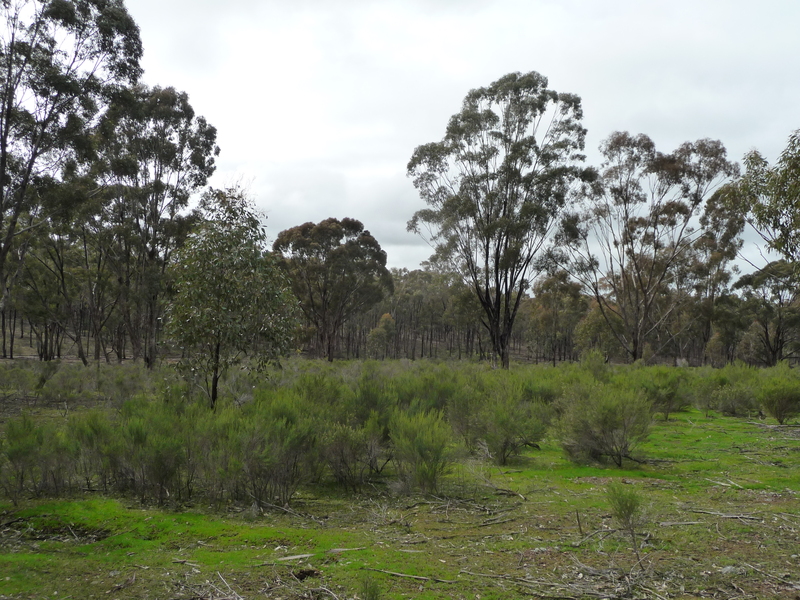 Much of the native vegetation among the cleared paddocks has regenerated in recent decades. Native shrubs and trees regenerated across more than 8,000 ha during the past 40 years, with about 1,800 ha being colonized every decade since the mid-1960s. Most colonized paddocks are now dominated by the native shrub, Drooping Cassinia (Cassinia arcuata). Trees seem to regenerate more slowly, and many older patches contained more trees, especially wattles, Grey Box (Eucalyptus microcarpa) and other eucalypts. This creates complex mixtures of shrublands and tree patches. Interestingly, nearly all of the regeneration was on infertile soils, and hardly any grew in fertile areas. We found that over 12% of the cleared area in the region now supports regrowth. If past trends continue, then regrowth will occupy 20% of private land on infertile soils by 2025. However, this will depend on how private land is managed in the future. Natural regeneration near Murchison. Virtually all trees and shrubs have regenerated since the 1970s. As far as we can tell, this region now supports the largest example of old field succession in south-eastern Australia. I wonder how many people imagined that biolinks would be created by regional economics rather than land use strategies, or that they would contain a ‘messy’ mix of trees and shrubs rather than lines of seedlings carefully planted by volunteers? Passive restoration may not be so neat and pretty, but it is way, way cheaper. Obviously, future vegetation patterns will depend on the wishes and needs of private land owners. We need to develop good extension programs to highlight the value of natural regeneration for biodiversity conservation in the region, and to emphasize the importance of passive restoration in Victoria’s network of biolinks. But first, we ecologists need to do something far more basic. We need to find out what species live in this regrowth, and which species are the ecological winners and losers. We also need to see how regrowth affects a range of ecological processes, such as soil water levels, fire hazard, carbon sequestration, and other ecosystem services and disservices that affect local landholders and the broader community. Passive regeneration provides hope, and evidence, that we can re-connect landscapes across large areas. Now we need to work out how to maximize its value, for landholders and biodiversity. In the 1940s, few people would have imagined that 1000s of acres of heavily grazed farmland would one day be covered with native trees and shrubs. As global temperatures continue to rise, who knows how this regeneration will change in the future. What habitats will it provide for wildlife? And how will future generations value the ecosystem services and habitats it provides? Barr, N. (2005). Understanding Rural Victoria. Department of Primary Industries, Victoria, Melbourne. Geddes, L., Lunt, I.D., Smallbone, L. & Morgan, J.W. (2011). Old field colonization by native trees and shrubs following land use change: could this be Victoria’s largest example of landscape recovery? Ecological Management and Restoration 12(1), 31-36.